The extinction of many ancient species may be due to humans rather than climate change, experts say. Large prehistoric animals in Tasmania may have been wiped out by human hunting and not temperature changes, a team of international scientists argue. This pattern may have been repeated around the globe on islands such as Great Britain, the scientists say. The findings were published in the US scientific journal - Proceedings of the National Academy of Sciences. For many years, scientists have been arguing about the causes of widespread extinctions of vast numbers of species at the end of the last Ice Age. What has caused the most debate has been the fate of megafauna - large bodied creatures in Australia that included three-metre tall giant kangaroos and marsupial lions. Humans arrived in Tasmania about 43,000 years ago, when the island became temporarily connected by a land bridge to mainland Australia. It had been thought that many megafauna were already extinct by this stage. But using the latest radiocarbon and luminescence dating techniques, the British and Australian scientists say they were able to determine the age of the fossilised remains of the megafauna more accurately than ever before. 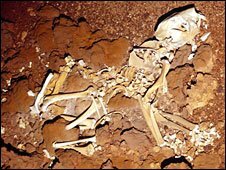 They discovered that some of the giant animals survived for 2,000 years after humans arrived, and at a time when the climate was not changing dramatically. The researchers concluded that these species were driven to extinction by hunting. Professor Chris Turney, from the University of Exeter, the lead author on the research paper, said that 150 years after the publication of Charles Darwin's seminal work The Origin of Species, the argument for climate change being the cause of this mass extinction had been seriously undermined. "It is sad to know that our ancestors played such a major role in the extinction of these species - and sadder still when we consider that this trend continues today," he said. Given Tasmania's history as an island, the research findings should help to disentangle the role of humans and climate change in other island environments, such as Britain, the scientists said. 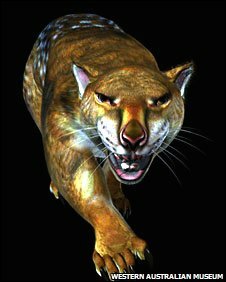 Previous research had found that on mainland Australia some 90% of megafauna disappeared about 46,000 years ago - soon after humans first settled on the continent.